It takes a special kind of person to keep a congregation of young children and their parents engaged, focused and involved for more than 5 minutes. Ellen Allard is that person. In the presence of a 3 or 4 year old, Ellen spins her magic through music and and prayers and stories and movement experiences that range from quiet and thoughtful to belly laughing and boisterous. In doing so, she masterfully takes the children and the grownups on a Shabbat journey that has them giggling at the antics of a Shabbos bear, enthusiastically raising their hands to share their ideas for tikkun olam and quietly sending healing prayers to those in need. Q: What is so unique about Ellen Allard’s Tot Shabbat Experience™? A: Ellen Allard has single-handedly redefined every pre-existing idea for what a Tot Shabbat service should look like. 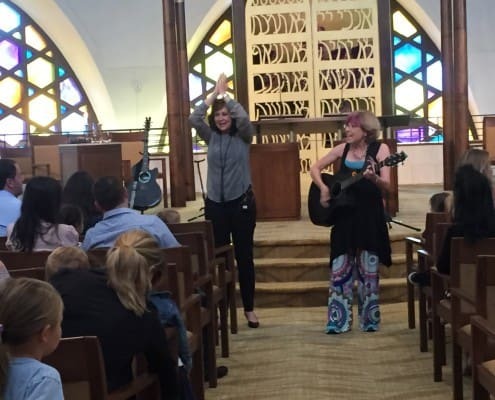 It has made her what many Jewish professionals call the quintessential master at leading worship services for young children. She has created a formula for a Shabbat service that can be likened to a quilt of songs and stories that masterfully weaves the rubrics of a Shabbat service together. Utilizing a number of flowing, seamless transitions that move the congregation from standing to sitting to dancing to chanting to keenly listening, Ellen Allard provides an amazing Tot Shabbat Experience™ that has the entire congregation riveted, from the beginning of the service until the end. Q: How long does Ellen’s Tot Shabbat Experience™ last? A: 30 – 45 minutes, depending on the age of the kids. The length of the service can be adapted to your needs. Q: Do the kids and/or grownups have a siddur? A: No siddur needed! Ellen has crafted a Tot Shabbat Experience™ that invites the entire congregation, young and old, to be 100% involved in body, mind and spirit. Because of the interactive nature of the experience, Ellen does not use a siddur. Q: Does Ellen offer her Tot Shabbat Experience™ on a Friday night and/or Saturday morning? A: Ellen will lead her Tot Shabbat Experience™ on a Friday evening or Saturday morning, to honor the minhag of your congregation. 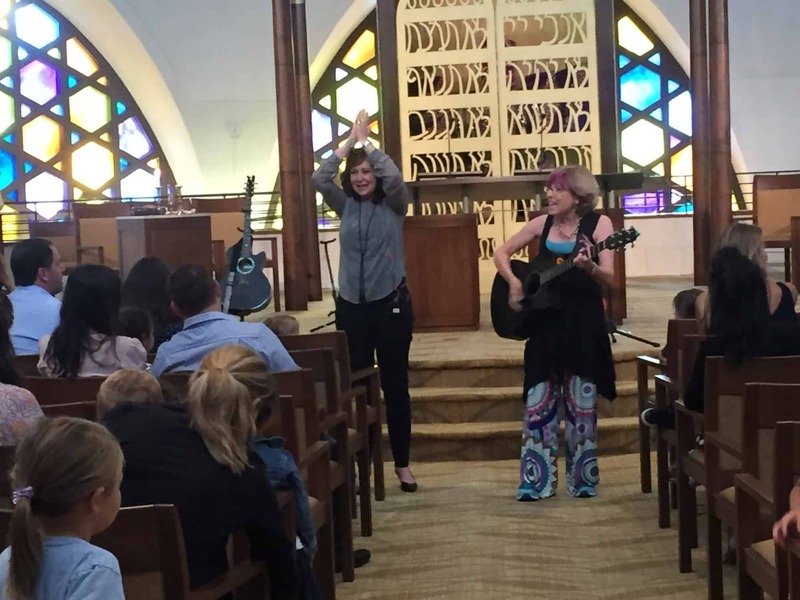 Q: How much singing is there during Ellen’s Tot Shabbat Experience™? A: Lots. And movement too. And stories. And some silliness. All the important components that make the service perfect for young children. Q: Is the synagogue clergy involved in Ellen’s Tot Shabbat Experience™? A: Ellen invites the clergy to be a part of the service; the extent to which that happens will be discussed during planning sessions prior to Ellen’s arrival in your community. The familiar faces will be an anchor for the young children. And the experience on the part of the clergy will help them begin to get a sense of how to manage a successful developmentally appropriate Tot Shabbat service. Q: Is there any special seating requirement for Ellen’s Tot Shabbat Experience™? A: After years of leading Tot Shabbat, Ellen believes that children and their parents get the most from the experience when they sit next to each other. There are two reasons for this – first, it optimizes the interactive family experience aspect of Tot Shabbat. Second, the children will be better behaved if their parents sit right next to them AND the parents will be better behaved if they’re not sitting next to another grownup and chatting. Whether seating is in chairs or on the floor will be discussed as your event is planned with Ellen. Q: What prayers does Ellen include in her Tot Shabbat Experience™? A: Ellen builds her Tot Shabbat Experience™ around the Barechu, Sh’ma, and Mi Chamocha prayers. Time permitting, she includes other prayers as well. She is also happy to weave other components into the service (i.e. birthday blessings, baby namings, etc.). Q: What is the best space for Ellen’s Tot Shabbat Experience™? A: This is an excellent question and an aspect of the experience that Ellen considers very carefully. 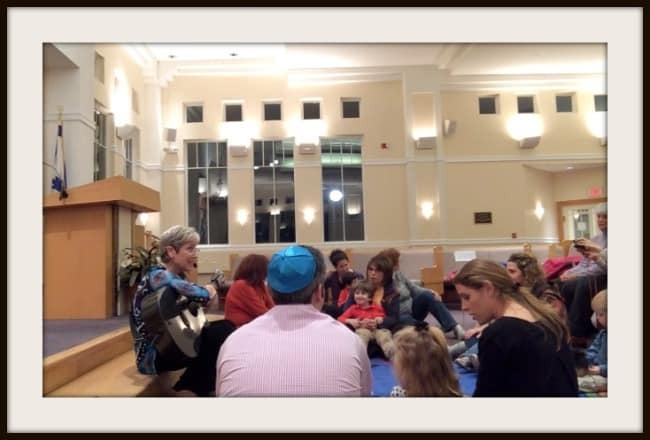 The two most common places for conducting Ellen’s Tot Shabbat Experience™ are a sanctuary and a social hall. They both can work equally well. It is best to avoid spaces that are large and cavernous, as the children can easily be distracted in that type of space. This decision can be decided on during initial planning discussions and/or when Ellen arrives at the synagogue. For more information, email ellen@ellenallard.com.